The oddly named French Madam Peak is located in the Argus Range a few miles northeast of Maturango, the highest point in the range. It has more than 900ft of prominence and is featured in Walt Wheelock's Desert Peaks Guide, two lists I have been working on recently. It also lies within the China Lake Naval Weapons Center which is never really a good thing. An approach from the east via Panamint Valley would be mostly on BLM land and unlikely to garner unwanted attention and it is this route that most of its few visitors choose. This route via Revenue Canyon is long and arduous with some 5,000ft of gain. It also requires a high clearance vehicle to reach the mouth of Revenue Canyon which I don't happen to possess. After some study of the maps, I found what I hoped would be an alternate route from the northwest, starting from the northern boundary of the base, south of Darwin. This route is also long, but with a starting point some 1,500ft higher, it should be that much less arduous (turns out that the route ended up being 6,000ft of gain with the undulations of the ridgeline, but that's a minor detail). I was happy to find that Ophir Rd, which touches the northern boundary as it makes its way around the south side of the Darwin Hills, was well-maintained and a cinch for any vehicle. The only trouble was the lack of turnouts near the base boundary, but I found a place with some packed sand that had been previously used and was able to spend the night parked here just off the road. I was up in the early morning before sunrise and on my way by 6:30a. I had spent the night only a few minutes from the base boundary. Today's excursion would travel more than 18mi through the base and though I was passing through the extreme northeast corner, the length of the excursion had me a little nervous. I headed southeast across a desert plateau for about half a mile before dropping down to the confluence of three major wash systems. Another mile further up Darwin Wash brought me to an old fenceline (probably when the base was smaller) and an old road I was looking for. This rocky road runs east then northeast, climbing 2,000ft to a 6,100-foot saddle on the west side of the Argus Range. I followed the road uphill for about a mile and a half, gaining about 1,000ft before leaving it to climb to the crest more directly. When I had first started out I could see headlights 8mi to the south heading north. These turned out to be heading to a base training site a few miles away that resembled a small Middle Eastern city. Shortly after 8a the desert quiet was broken by the sound of automatic rifle fire which kept up for the next several hours. Whether they were engaged in some sort of war game or just target practice I couldn't tell as it was too far away to see individuals. I was happy to be heading in the opposite direction. It was 8:30a when I reached the crest. In addition to French Madam, I planned to visit a few bonus points - one was an unnamed summit close to where I reached the crest some 3.5mi north of French Madam. The other was the Argus Range Wilderness HP, about 1.5mi south of French Madam. This would make for a long ridge walk of nearly 5mi and as I came to find, there was some significant elevation gain and loss that I had not really noticed from the innocent-looking lines on the topo map. I didn't mind really, because it turned out to be a wonderful hike with open, easy terrain and fantastic views. Those to Telescope and the Panamint Range were mostly washed out due to the position of the sun, but along the Argus Range and across the base to the Coso and Sierra Ranges were quite nice. Each bump along the way would take me a few hundred feet higher until eventually I was high enough to encounter some pinyons growing at the highest elevations and even some snow on the shadier aspects. The snow was old and consolidated, from weeks earlier - the most recent storm didn't bring any new stuff. There was only a small amount of snow and I never had to set foot on it anywhere along the route. It was 10:45a by the time I reached the highpoint of French Madam. The summit register I found was a gem. It was placed by Burl Parkinson in 1959 who had given the name Pink Mtn (it didn't stick, obviously). Burl, along with his parner Francis Foley died from a fall only a month later while climbing Boundary and Montgomery through a storm. One was a year older, the other a year younger than myself at the time of their deaths, a sobering note. A peak south of Maturango was officially named for Parkinson a few years later and appears in Wheelock's 1962 guidebook. 16yrs passed before the second entry. In the 56yrs the register has been at the summit, only 11 pages have been used and a single one has sufficed to contain the three entries this millenium - this is one rarely visited summit. I didn't stay long at the summit, continuing south along the crest in search of the Argus Range Wilderness HP. The point has no prominence, just a point off a subsidiary ridge to the east of the main crest, at the corner of an arbitrary township section drawn by cartographers on a map. I suspected it might not be easy to find and had no idea if someone had been there before me to leave a cairn or register or something to mark its location. 45min after leaving French Madam, with plenty more undulations along the ridge, I was searching down the east side in the vicinity of where my GPS told me to find the highpoint. Not finding anything at first, I was about to build a cairn in the general area when I spotted a cairn next to a small bush. Sticking up through the cairn was a 1940 survey marker from the US General Land Office marking the corner of the map section, only about 30ft from the point indicated on the GPS - pretty good, I thought. I took a few pictures but otherwise left the site undisturbed - this has certainly got to be one of the harder CA Wilderness HPs to reach. By now I was kinda tired of the ups and downs the ridgeline had put me through and would have preferred to go back to the crest and then drop down the other side. This would have been the easiest return with minimal gain, dropping down through the broad cirque north of Maturango where Argus Spring is located. An old road runs into this canyon and could have made the return that much easier. But I had a concern that this road, once out of the cirque, would run right by one of the base proving grounds. Two half mile-long strips that from a distance look like runways, are located just above Darwin Wash on the west side of Maturango. Though I hadn't seen anyone walking about, from a distance it looked there were vehicles parked there. A quarter mile distance seemed too close for comfort. So I chose instead to climb halfway back up to French Madam and then drop down into the next side canyon to the north. Aside from the uphill portion along the crest, the rest went smoothly enough. The canyon was fairly steep, but trees and forest duff helped cushion the ground and make much of the upper descent a breeze. Below the treeline there were some ugly rock sections that I had to slow for, but this gave way to a more traditional desert sandy wash in the lower part. As a bonus I got to pass by the Argus Sterling Mine, though not much more than an old cabin with a rusting iron stove left to the elements. Where the actual mineshaft was I didn't discover. Below the mine I eventually came across an old road depicted on the topo maps traversing the western slope of the range. This would allow me to stay further away from any possible activity in Darwin Wash, though it did appear I was more open to detection. The road was periodically marked by white-painted barrels about every mile and provided views across the basin. The noisy rifle practice had stopped hours earlier and all had since been quiet, but I kept a watchful eye to the west for any sign of vehicle or human movement. Some odd sounds that had initially startled me turned out to be part of the burro brigade that inhabits much of the range. I had seen their droppings all day long, but it was only as I was plying this road that I came across about a dozen of the feral animals in various groups. Unlike horses or sheep that generally take off when I approach, the burros have a curious habit of trotting only a short distance before turning to watch where I'm going. They often run ahead in the same line I'm walking, repeating this trot and watch manuever a dozen or more times. You'd think they'd get tired of it, but maybe their curiousity gets the better of them. When I was well north of any base sites, where the road starts to climb to join the original road I had ascended on, I left the road to drop down into Darwin Wash to complete my return back across the desert floor to Ophir Rd where I'd left my van. It was nearly 3p by the time I returned. It seemed I had a few more hours of daylight, so I beat a retreat back through the town of Darwin, out to SR190, and then north on Saline Valley Rd. My last peak of the day was officially unnamed Jack Gunn Peak, a name that first appears in Wheelock's guidebook but never made it to the maps. 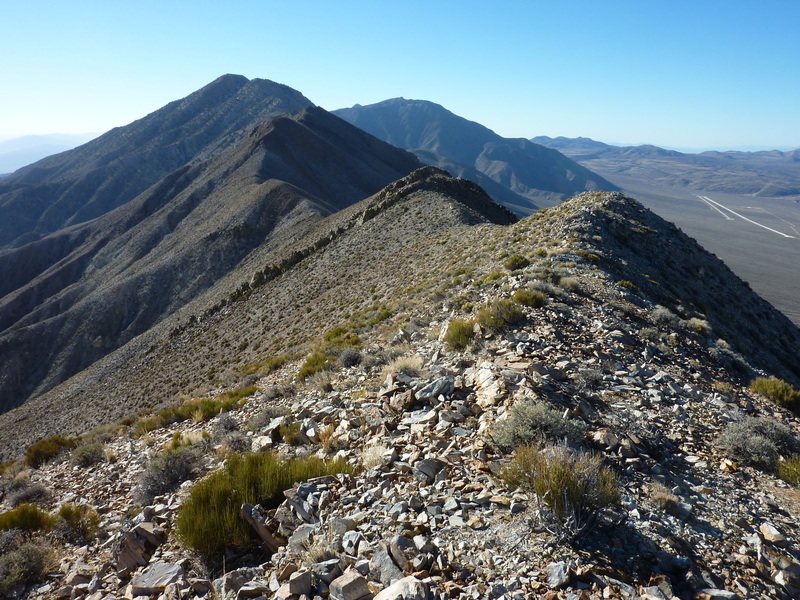 Named for a colorful Death Valley character, the peak is part of the Santa Rosa Hills atop the Darwin Plateau, about four miles north of SR190. Found just inside the expanded Death Valley NP, the area is dotted with old prospects serviced by old 4x4 roads that can still be driven. These can be used to drive to the base of the mountain on the north side, but without such a vehicle I would be starting from Saline Valley Rd, about a mile to the west.